Spindletop Gladys City Boomtown Museum will be showing the movie, “Linotype: The Film,” on Feb. 9 at 1 p.m. The Ben J. Rogers Regional Visitors Center will provide popcorn and water. Afterwards, hop on over to Lamb's Print Shop and see a real Linotype and other printing machines working. Guests will be able to ask questions to the operators and learn about the printing industry. “Linotype: The Film” is a feature-length documentary centered around the linotype casting machine. Called the "eighth wonder of the world" by Thomas Edison, the linotype revolutionized printing and society. The film tells the charming and emotional story of the people connected to the linotype and how it impacted the world. 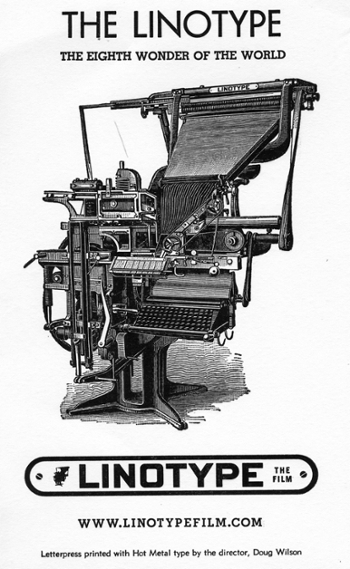 The linotype (pronounced "line-o-type") completely transformed the communication of information similarly to how the internet is now changing communication again. Although these machines were revolutionary, technology began to supersede the linotype, and they were scrapped and melted-down by the thousands. Today, very few machines are still in existence. The highly-skilled operators of the linotype are in a battle against time. If their skills are not passed along to a new generation of operators, the machine will die completely. There is a small group of former operators who want to save the linotype from the scrap yard, but some see this as a fruitless endeavor. The cost to see the movie is regular museum admission, $5 for adults, $3 for senior citizens and $2 for children, ages 6-12. The Spindletop Gladys City Boomtown Museum is located on the corner of Jimmy Simmons Boulevard and Cardinal Drive on the Lamar University campus. For more information, please call 409-880-1750 or visit www.spindletop.org.